Michael Bronstein joined the Department of Computing as Professor in 2018. He has served as a professor at USI Lugano, Switzerland since 2010 and held visiting positions at Stanford, Harvard, MIT, TUM, and Tel Aviv University. Michael received his PhD with distinction from the Technion (Israel Institute of Technology) in 2007. 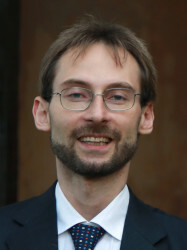 His main expertise is in theoretical and computational geometric methods for data analysis, and his research encompasses a broad spectrum of applications ranging from machine learning, computer vision, and pattern recognition to geometry processing, computer graphics, and imaging. Michael has authored over 150 papers, the book Numerical geometry of non-rigid shapes (Springer 2008), and holds over 30 granted patents. He was awarded four ERC grants, two Google Faculty Research awards, Amazon ML Research award, and the Royal Society Wolfson Merit award. During 2017-2018 he was a fellow at the Radcliffe Institute for Advanced Study at Harvard University and since 2017, he is a Rudolf Diesel fellow at TU Munich. He was invited as a Young Scientist to the World Economic Forum, an honor bestowed on forty world’s leading scientists under the age of forty. Michael is a Fellow of IEEE and IAPR, alumnus of the Technion Excellence Program and the Academy of Achievement, ACM Distinguished Speaker, and a member of the Young Academy of Europe. In addition to academic work, Michael is actively involved in commercial technology development and start-up companies in leading technical and management roles. He was a co-founder and VP of technology at Novafora (2005-2009), co-founder and technical advisor at Videocites (2014-), and one of the chief technologists at Invision (2009-2012). Following the multi-million acquisition of Invision by Intel in 2012, Michael has been one of the key developers of the Intel RealSense 3D camera technology in the role of Principal Engineer. His most recent start-up Fabula AI exploits a novel class of geometric deep learning algorithms to address the global scourge of fake news in social media.